Established in May 2007, Beijing Tunnel Engineering Co.,Ltd(BTEC) is a diversified joint-stock company with 65.2 million RMB of registered capital and 270 million RMB of total assets. We are specialized in tunnel, underground construction,bridge,subgrade and PPP project with tunnel construction at the core. BTEC has more than 270 employees, including 2 professor level senior engineer, 30 high level technicians, 80 medium level technicians and 12 architects.It also owns more than 200 sets of advanced construction machinery and equipment with 80% of construction achieved mechanization and above 2 billion RMB of annual construction capacity. The projects of BTEC over all China including a number of national large-scale key projects, such as Nanning-Kunming Railway,Guangdong Zhaoqing Yutiao hydropower station, Jilin Changchun-Huichun Expressway, JilinTonghua-Xiapai Express-way.ShangdongJinan-Qingdao expressway, Shenyang-Dandong Expressway, Wenzhou-Fuzhou Railway, Jilin along river Highway, Liupanshui- Zhanyi Railway. 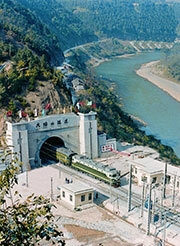 chongqing-Lichuan Railway,Shanxi South Central Passage.Zhanjiang Petroleum reservoir and so on. adhering to the spirit of vigorousness, concentration, exploiting, innovation, cooperation and endeavor, led by Scientific Outlook on Development and abiding by market economy rules,BTEC is continuously improving the capability of tech-nological development, market competition and intergrated management. Moreover, the company also commits itself intocreating delicacy, self-developing, dedicating to society and benefiting the staff. Thinking about the future, the road is long come.Insisting on the outlook of "strong,bigger and more delicate",by strengthening management inside and establishing imsge outside , BTEC is pursuing deepening reform and innovation.Furthermore,the company also makes efforts to achieve leading.scientific and harmonious development, as well as establish into a comprehensively construction company with market competitiveness.